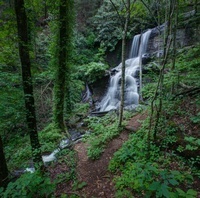 The DeSoto Falls Recreation Area is located off Highway 129 just inside the National Forest boundary. The campground is a scenic spot with easy access for either a weekend of camping or a quick hike to the falls. There are two waterfalls which can be easily viewed along the DeSoto Falls trails. Trout fishing is popular along Frogtown Creek which flows adjacent to the campground. A mature forest provides the perfect setting for a family recreation getaway. From Blairsville, GA take U.S. Highway 19/129 south for 17.0 miles to campground entrance on right. From Dahlonega, GA take Highway 19 north for 18.0 miles to campground entrance on left.